- A woman is like a wave, her self-esteem rises and falls in a wave motion. One moment she’s feeling good and all loving and caring and the next moment, she’s crashing down, both of the statutes is temporary and it is irrational to expect a woman to stay loving and caring all the time. After reaching her peak, she crushes down and she’s filled with an emptiness inside and a need for love. During this down time, she especially needs to talk about her problems and needs to be heard and understood. - When at her down time, a woman might suddenly experience negative feelings, like being unsupported, misunderstood. But soon after reaching the bottom, she automatically feels better, rises again and is willing to give for her relationship again. - A woman’s ability to receive and give love in her relationship, largely, depends on how she feels about herself when she feels good about herself, she’s most willing to give love but at her down time, she tends to feel insecure and vulnerable. That’s when she needs her man’s support most, in order to make her feel better about herself, and remind her how much she means to him. This might be confusing to the man who, one minute he sees his woman glowing with confidence, and the next minute, she’s so vulnerable and insecure. But it’s irrational to expect a woman to stay loving and caring all the time. Women rise and fall in their ability to love themselves and others. - A man often, feels responsible for his woman’s mood, when she feels good, he takes credits and when she feels bad, he’s confused and frustrated, he doesn’t know what to do to make her feel better. To make things worse, he tries to fix it. He’s telling her not to be upset and she feels misunderstood and even more upset. She was crying for unconditional love and support, she didn’t need a solution, she just needed someone to listen to her and show her empathy. However, a man who had been supporting to his woman at her down time might feel confused as he sees his woman feeling even worse. This is a good sign indeed for a woman needs to hit the bottom before rising again, that’s her cycle, and her man’s support might help her hit the bottom faster. - At her down time, a woman seems to have a lot of trouble, she’s complaining and whining, then when she rises again and is feeling better, she’s all positive and full of life again. To a man, it seems as if all her problems had subsided, that’s why he feels confused when she feels low again and start complaining about the same problems. It becomes irritating to him to go over the same matters round and round. These issues are heavily charged from her past, whatever remained unresolved will eventually surface again when she’s feeling low. Through feeling supported, a woman is able to journey in and out of her down time without conflicts and that’s the blessing of a loving relationship. She’ll appreciate her man’s support and eventually, her future down times won’t be as extreme. - It’s natural for a man to give advice and try to find a solution when someone tells him about his troubles, that’s what a man would need if he was the one who’s speaking. Men pride themselves for their accomplishments when faced with a problem they try to find a solution by themselves, and when they feel the need for an expert advice, they go to someone they trust and confide in him. 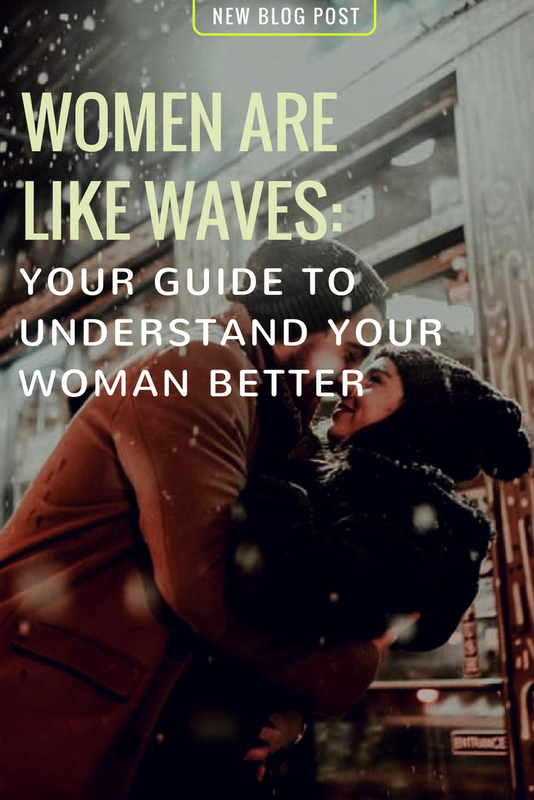 However, you need to understand that we, as women and men are different and it’s irrational to expect your woman to think the way you do and need what you need. - When a woman confides in you and tells you about her troubles, she isn’t asking for a solution, she’s crying out for empathy, she needs someone to listen and make her feel understood. That seems quite simple to do, just listen, nod in agreement and show some empathy, however, men find it most hard and fail in doing it. They feel confused and frustrated when they try to help and their advice’s been rejected, they feel being useless and they lose their focus, they can’t see the point from a woman’s talking. - A woman talks to relief herself, she understands better when she processes the matters out loud, she thinks out loud. That’s different from the purpose of talking to a man, but that’s how things are and it’s irrational to expect otherwise. - When you support your woman and still she isn’t feeling any better, or worse, she feels even more upset, don’t get confused, a woman only needs to hit the bottom before she can rise, like a wave, she can’t rise without hitting the bottom. - You also can’t predict how long will she stay feeling upset, sometimes it takes longer than the other times, but eventually she’ll rise again. You might even have heard of some couples who never fight and suddenly get a divorce. In many of those cases, the woman had suppressed her negative feelings in order to avoid getting into fights and as a result, she became passionless and unable to feel her love. When suppressing negative feelings, positive feelings becomes suppressed as well and while avoiding arguments is healthy for a relationship, it shouldn’t be by suppressing negative feelings. Even a strong woman is exposed to the wave motion of her feelings. Some men, mistakenly think that if the woman is successful in her work, she’s less likely to experience this cycle. The opposite is true when a woman in the work world is exposed to more stress and emotional pollution, therefore, her need for emotional cleansing becomes great. When she comes back home after a stressful day at work, she needs to find warmth and support. However, repressing her negative emotions while it doesn’t affect her competence at work, it does affect her relationships and her communications with people she loves. Rich or poor, a woman goes through a natural cycle of alternatively feeling good and then feeling vulnerable and insecure. Her problems and issues arise when she’s feeling low and disappears as soon as she feels good again, that doesn’t mean, however, that the problems are solved. Often, men think that money is the solution to every problem. When being poor, a man can empathize with his woman’s complaining and validate her negative feelings and she felt cared about. From his perspective, his woman has a good reason to be unhappy, they didn’t have enough money. He believes that as soon as they can get more money, things will get better. Then, after some years of hard working and earning enough money, the man is confused when his woman keeps complaining. He can’t empathize with her anymore and is telling her that she shouldn’t be upset. He thinks that she should be happy all the time. He didn’t realize that money can’t prevent his woman from going through her natural cycle, it can’t prevent her from feeling upset. If anything, the richer they get, the harder it is for the man to validate his woman’s negative feelings thus they fought more. He thinks that they were happier when they were poorer. Regardless of being wealthy or not, a woman needs to feel upset and let her wave to crash. - A man’s love and support can’t instantly resolve his woman’s issues. However, it can help her reach her well faster so she can rise up again. He can expect her issues to surface again and again, but each time he can get better at supporting her. - A woman going into her well isn’t her man’s fault, nor it is his failure. She isn’t broken and he doesn’t have to fix her. It’s her natural cycle. As we can’t live in one unchangeable weather, it is vital for a woman to go through her ups and downs.